Bear Lake is a family tradition for a lot of people in my Northern Utah neighborhood. This beautiful turquoise lake surrounded by mountains on the Utah-Idaho border is a fun place for boating, beach picnics, fresh raspberry shakes and family memories. However, unless you know somebody with a cabin or you prefer camping, there are surprisingly few lodging options. My family falls short in both of those categories, so I paid attention when buzz started to build for Conestoga Ranch – a new luxury camping resort at Bear Lake. I jumped at the chance to try it for ourselves. We found that Conestoga Ranch offers a fun and unique style of lodging that we found to be particularly well-suited for families. My 11-year-old daughter was especially excited to sleep in a covered wagon, sit around the camp fire toasting marshmallows and visit the game tent. Not once did she ask for a Wi-Fi password, though the resort does have it. At the end of our stay, she announced that Conestoga Ranch was everything she hoped it would be. Our whole family agrees that it was the highlight of our trip to Bear Lake. Conestoga Ranch offers the choice of sleeping in a tent or a conestoga wagon, all outfitted with bedding, towels, electricity and beds for up to eight people. Our wagon was built for four, with one king bed and two twins – perfect for my family. I was surprised by how much space we had inside our wagon to move around and sturdy steps made it easy to get in and out. Each tent or wagon has a picnic table, a set of high-quality adirondack chairs and either a private or group fire pit. We were given two bundles of wood, and when one of the resort staff started the fire for us, that was above and beyond my expectations. We brought our own hot dogs and s’mores supplies for a fun camp fire dinner. All parking is located at the Main Lodge. Our luggage was transported to our wagon by golf cart. We found electric lighting and outlets in our wagon, but the outlets were the same type as in our car. If you have a car charger for your mobile devices, you’ll want to bring it to your tent or wagon. We were assigned to Wagon #7, which was located just a few steps away from the Main Lodge, and more importantly, the bathrooms. That circle of wagons is also closest to other resort amenities. Unless you have a Grand Tent with a private bathroom or just prefer to get away from the pack, I highly recommend booking one of the wagons near the Main Lodge. Amenities at Conestoga Ranch include restrooms with showers, playground, game tent and restaurant. On summer weekends, Conestoga Ranch hosts a rodeo and concerts. The bathroom arrangements at Conestoga Ranch are the next best thing to having a private bathroom. Rather than having a communal ladies’ or mens’ room, Constoga Ranch has bathroom suites at the Main Lodge – each with a single shower, toilet and sink. Shampoo, conditioner and body wash are provided. Pick an open bathroom, lock the door and enjoy complete privacy. There were more than enough suites to go around during our stay. The game tent was a favorite spot for our kids. Inside, we found a video game, basketball toss and air hockey – all coin operated – and a table that would be perfect for an evening board game. Outside, ping pong and corn hole are set up. We could smell the delicious aromas coming from the Campfire Grill all evening, and we even stopped by to look at the menu. This open air restaurant serves wood-fired pizza, steaks, salads and has a kids’ menu with the usual favorites. It is large enough to accommodate large groups. We saw a family group of 30 being served. I also spotted a small sports bar on the other side of the restaurant. You could get by at Conestoga Ranch with little more than pajamas and a toothbrush, since Conestoga provides a lot of what you need and has a restaurant and general store for everything else. To keep costs down, we brought our own campfire sticks and food and noticed that other families did the same. It can get chilly at night, so don’t forget to pack a jacket or hoodie for everyone. It was unusually cold on the July night we were there, and we wished that we had brought extra blankets. I’ve been told that Conestoga Ranch may soon provide those – they had only been open a few weeks when we were there. Bring a few dollars in quarters for the game tent, or a few singles to change at the general store. If you enjoy getting to know new people, Conestoga Ranch is a friendly place. We shared a big fire pit with four other families, all of whom seemed to have boys around the same age as my 8-year-old son. They were on a first name basis within the first hour and spent most of the evening and morning in an ongoing game they made up on the playground. In the meantime, I chatted with their parents around the campfire. One family in our wagon circle was visiting Conestoga Ranch for the second time in its first month. They had stayed in one of the tents on opening weekend and liked it so much that they recruited another family and booked wagons together a few weeks later. We also met two sisters from different states who were meeting at Bear Lake with their kids. 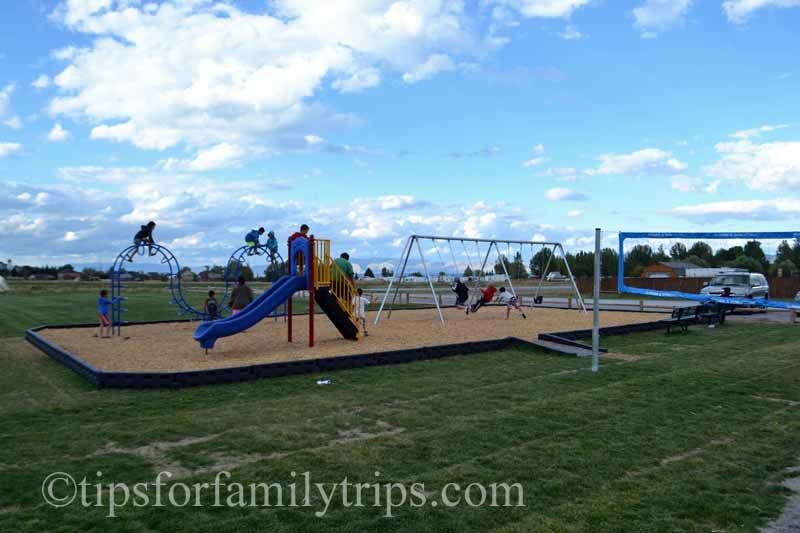 That’s the kind of easy, family-friendly atmosphere that Conestoga Ranch offers. To find out more, visit them online at www.conestogaranch.com. Disclosure: We received complimentary lodging at Conestoga Ranch for the purposes of review. All opinions are my own.